Information: Although Mgr. Dusina in the report of his Pastoral visit in 1575 states that Mosta was a parish, in actual fact Mosta became a parish in 1608, and the parishioners immediately started building a new church on the plans drawn by Tommaso Dingli. The present church is based on the plans of George Grognet de Vasse. Name: Parish Church of the Assumption Dedication date: 15 October, 1871. Masses: Sundays and Feast Days: 5.00, 6.00, 7.00, 8.00, 9.00. 10.00, 11.00 a.m.; 5.30 p.m. Saturday Evening 5.00p.m.- 6.30 p.m. Weekdays: 5.30, 6.00, 6.30, 7.00, 7.45, 8.30 a.m.; 6.30 p.m.
Other information on churches under this parish: PATORAL ZONES (erected through a decree on 17 October 1988) Bidnija The church at Bidnija was built in 1920 and dedicated to the Holy Family; in 1991 it became a centre for pastoral activities. Priest in charge: Rev Raphael Demartino Families 62 Holy Masses Sundays and Feast Days: 11.00 a.m. Weekdays: 6.00 p.m. (winter); 7.00 p.m. (summer) Ta' Mlit The chapel is dedicated to Mary Mother of the Church; it was blessed on the 30th October 1998. Priest in charge: Rev Mario Sammut Families: 700 Holy Masses: Sundays and Feast Days: 9.00 a.m. Saturday Evenings: 6.00 p.m. Weekdays: 6.00 p.m. Saint Andrew The centre was opened in 1991. Priest in charge: Rev Paul Sciberras Families: 400 Holy Masses: Sundays and Feast Days: 8.00 a.m. Weekdays: 6.00 p.m. Saint Margaret The provisional chapel for the pastoral zone is dedicated to Christ the Redeemer and is situated in Triq il-Midbah. Families: 650 Holy Masses Sundays and Feastdays: 9.00 am Weekdays: 6.00 pm OTHER CHURCHES Church of St. Anthony the Abbot The church was built in 1657 on the site of an earlier church built in 1575. Priest in charge: Mgr Salvatore Magro Holy Masses: Sundays and Feast Days: 7.30 a.m. Weekdays: 11.00 a.m. Church of St. Sylvester The church was built in 1657; today devotions in honour of Our Lady of Lourdes are held on the days of the apparitions; marriages may be celebrated in the church. Priest in charge Mgr Salvatore Magro Holy Masses: Sundays and Feast Days: 7.30 a.m. Weekdays: 5.30 p.m. Church of St. Leonard The church was built in 1659 on the site of an older church which existed at the time of Mgr Dusina's pastoral visit in 1575. Devotions in honour of Our Lady of Pompei are held in it, especially on the 8th May. Priest in charge Archpriest. Immaculate Conception church The church was built in 1659. 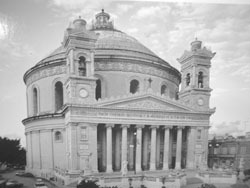 It was rebuilt in 1965 after it had been demolished by bombs during the War. Church of the Visitation The church was built in 1610, but was rebuilt after its destruction by bombs during the last war. Priest in charge Archpriest Holy Mass daily at 08.30 am. St. Margaret's Church This is a very old church and near it is the cemetery where the victims of the 1592 plague are buried. Priest in charge Archpriest Church of Our Lady of Hope The church is built over a cave where according to tradition a young girl from Burmarrad took refuge to avoid falling into the hands of Moslem pirates. Priest in charge Rev Edgar Vella Holy Masses: Sundays, Feast Days and weekdays: 7.45 a.m. Church of St. Paul the first hermit The church is situated in Wied il-Ghasel. Two feasts, one of Saint Paul the Hermit and another of Our Lady of Grace, are celebrated. Church of St. Andrew This is a small church which has always been considered as forming part of Mosta parish. St Monica's Chapel The Augustinian Sisters opened a residence in Mosta in 1929 and then built a large institute in 1952. The chapel of the institute is open to the public. Holy Masses: Sundays and Feast Days: 7.00, 8.30 a.m. Saturdays: 6.45 a.m.; 6.30 p.m. Weekdays: 6.45 a.m., 6.00 p.m. Chapel of Our Lady of Mount Carmel The Franciscan Sisters of the Sacred Heart opened their "Pax et Bonum" Home in Mosta in 1961 as a residence for elderly people. Holy Masses: Sundays and Feast Days: 6.30, 9.30 a.m. Weekdays: 6.30, 8.30 a.m.